This is the 2nd installment of a 3 part series in which I will take a look at the most notable IDP free agents of the 2011 season (the last article of the series will examine notable defensive linemen free agents). This article will continue to be added to as the off-season progresses. For an example of what it will eventually look like, you can take a look at last season's 2010 Notable IDP Free Agents article. 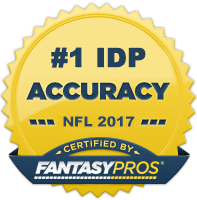 I personally find it beneficial to be aware of the most important IDP free agents and track were they land in the off-season since it usually makes a big impact on their fantasy value. If there are any players you would like to see added to the list. Just leave a comment and I will make sure to add them with some analysis when I get the time. Goldson finished the 2010 season with 68 total tackles, 1 sack, and 1 interception. Too many this was a huge disapointment as he was a top 10 DB in 2009. However, I think that Goldson's 2009 season was more than likely an aberration and that his future numbers will more closely resemble what he put up in 2010. It remains to be seen whether or not he will be a 49er come next season, but if he is, I wouldn't value him as anything more than a low-end DB3 or high-end DB4. Harper is one of the most consistent tackling safeties in the NFL. He consistently plays close to the line of scrimmage in defensive coordinator Gregg Williams' attacking style defense. He will more than likely be back and continue to be valuable as a low-end DB1 in most fantasy leagues. If you are the type of IDP owner who appreciates a consistent tackling safety, Harper is a definite top 10 choice at his position. Landry had by far his best fantasy season this year with 86 solo tackles and 25 assists. This increase in tackle numbers were largely due to the Ravens front seven being a bit more leaky than in previous years. I don't think a lot of people in the fantasy world have begun to fully appreciate Landry's season yet. He will likely fly into the 2011 season under the radar. I think he could be a very solid DB3 pick next year. Over the last 3-4 seasons, Mikell has established himself as one of the league's better run-stuffing safties and should be a great fit for the Rams scheme. run-stopper. However, the 2010 season exposed a lot of Pollard's coverage deficiences and showed why he was originally cut by the Chiefs. Although Weddle had a down year from a fantasy perspective, he still played solidly on the field. He's equally good against both the run and the pass and is an effective leader on the field. The Chargers will look to bring him back. However, it wouldn't be the worst thing for him to move teams and possibly slide into a strong safety position. Bailey will more than likely not be back in a Broncos uniform next year as he is going on 33 years old and the Broncos will be in rebuilding mode. Bailey hasn't been fantasy relevant for a few seasons and that won't change heading into next season. For an undrafted player out of Shippensburg, the scrappy Grimes had a heck of a season and should be rewarded by the Falcons with a new contract. He's a solid tackler and one of the best in the league at registering pass deflections and he also had 5 interceptions making him a low-end CB1/high-end CB2. Joseph was a big reason for the Bengals staunch pass secondary i n 2009. The 2010 season didn't go as well for Joseph as the Bengals pass secondary struggled throughout the season and JJ himself battled through injuries. Cincinnati may opt to use the franchise tag on Joseph and if they do, Joseph will sign. He remains a decent big-play option in fantasy leagues, but shouldn't be trusted as anything more than a DB3. The combination of above-average tackling skills and benefitial defensive scheme have helped Marshall to become one of the most consistent tackle-producing cornerbacks in the NFL. However, he got himself into the coaches' doghouse in 2010 and his replacement, Captain Munnerlyn, played well in his absence. With all the issues the Panthers have coming into the 2011 season, I wouldn't expect Marshall to be a priority signing. If he doesn't end up re-signing with Carolina, his value will drop quite a bit.